It was a leisurely morning when we woke up at the Red Roof Inn in Rochester on the fifth day of our drive around Lake Erie and Lake Ontario. 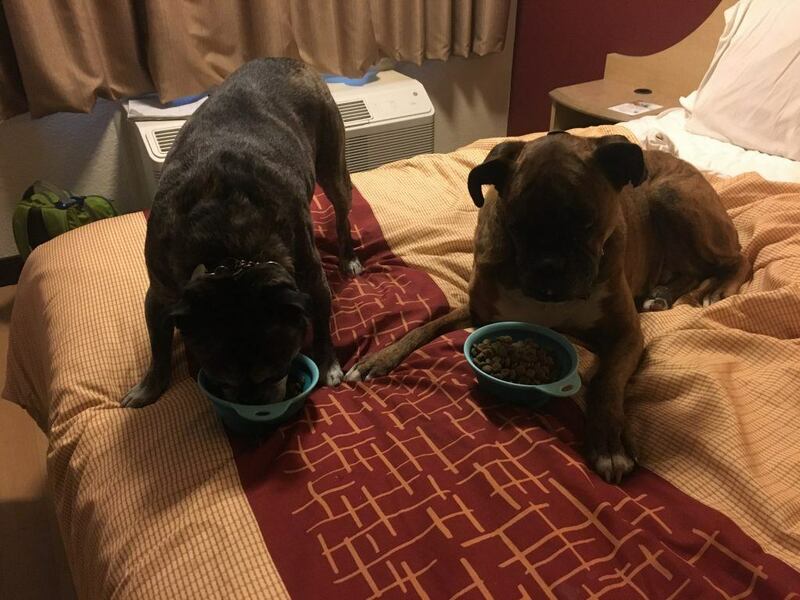 The dogs enjoyed breakfast in bed while I packed our stuff before we checked out of the hotel and drove to nearby Sips for coffee and a breakfast sandwich. 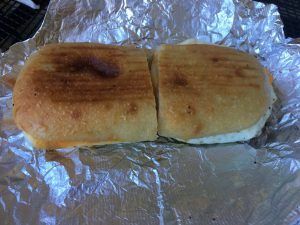 The sandwich had egg, bacon, and cheese, and was been grilled. I was able to enjoy it at a table in front of the cafe with the dogs waiting expectantly for their share. The view of the parking lot from the table left much to be desired but at least I wasn’t crammed in the car with exasperated huffing in my ear (I’m looking at you Piper). Instead I was able to sit at a table with exasperated huffs in front of me. The coffee was good too. With breakfast done, we left Rochester and continued east. 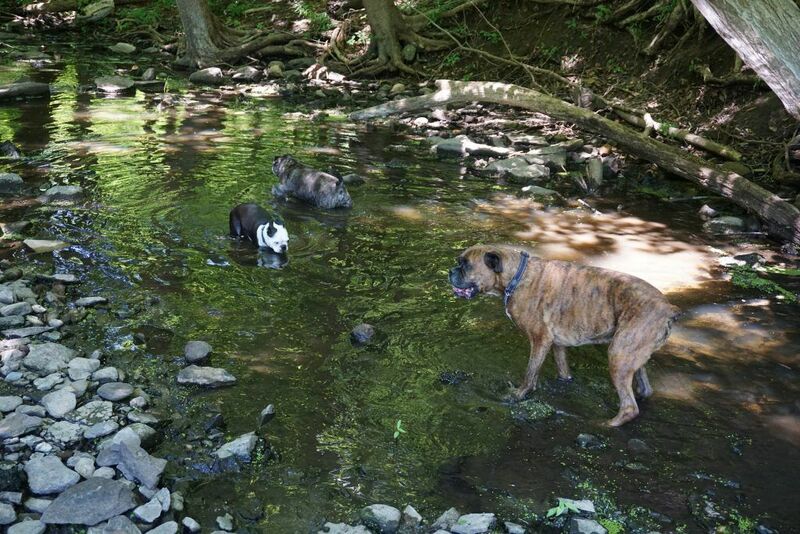 When we saw B. Forman Park, I thought this would be a great place to let the dogs swim and stretch their legs. There was no beach at the waterline and the shore was made of large boulders with tons of signs that said to stay off the rocks. There were so many signs that I couldn’t “not see” them and with enough staff in the park that I didn’t want to risk getting caught which is probably for the better since it would be easy for little feet to get stuck in the rocks. So we kept driving once the (dry) dogs climbed back into the car. Fun fact: The Great Lakes Scenic Byway was one of the first roads to be designated a National Scenic Byway. 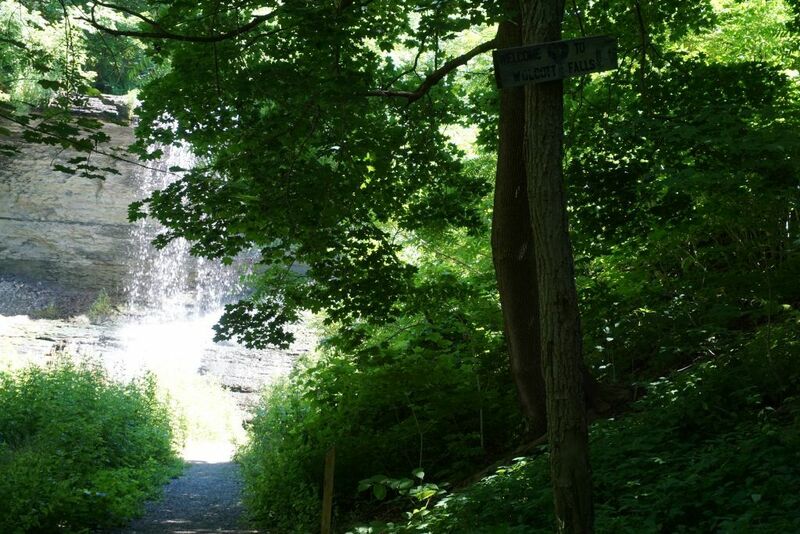 We stopped again when I saw a sign for Wolcott Falls Park, in Wolcott of all places. 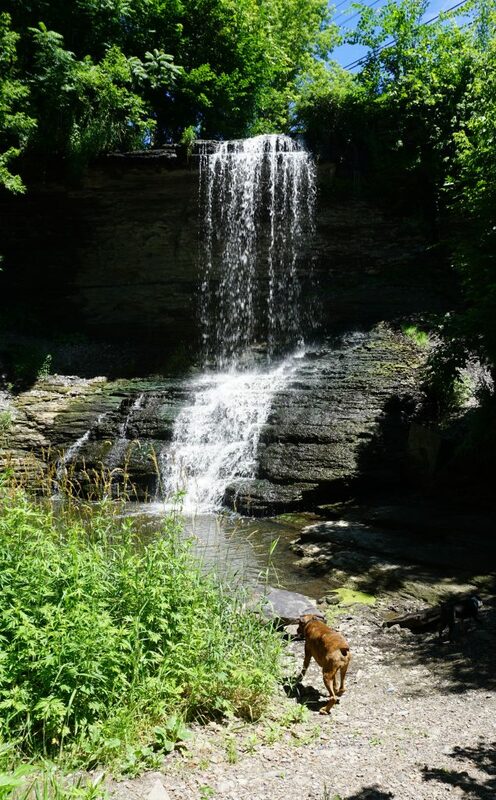 There’s a viewing platform at the entrance to the park but as I was taking a few quick pictures, I couldn’t tell from where I stood if there was a better view of the falls so I took the dogs for a walk around the park to scope the area out. Near the playground, there was a gap in the fence and a trail that led down. Even though we were in the middle of a town, the vegetation around the trail felt slightly overgrown so it seemed like a wild place. After a short hike down, we came to the river. 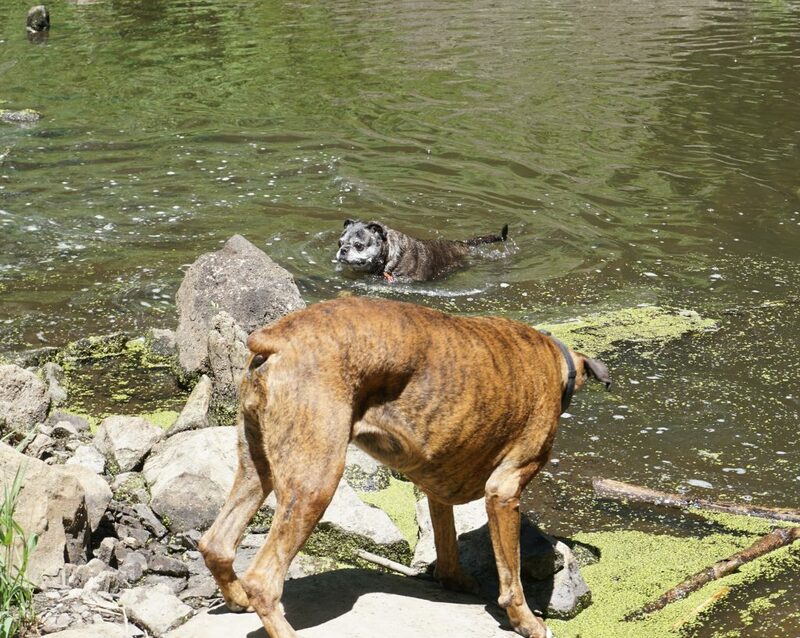 Needless to say, the dogs ran straight to the water. 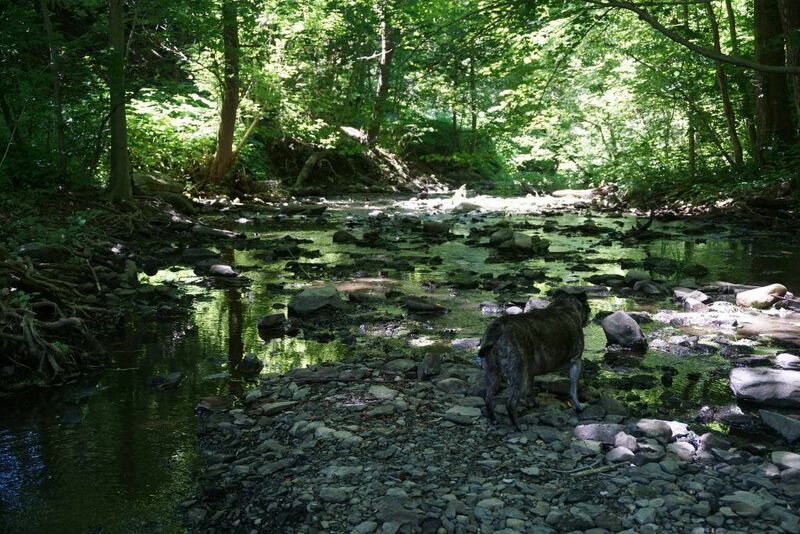 In fact, Jack has this crazy ability to find water no matter where he is and he rushed on ahead before we even saw the river. Even almost totally blind, he can still find water. 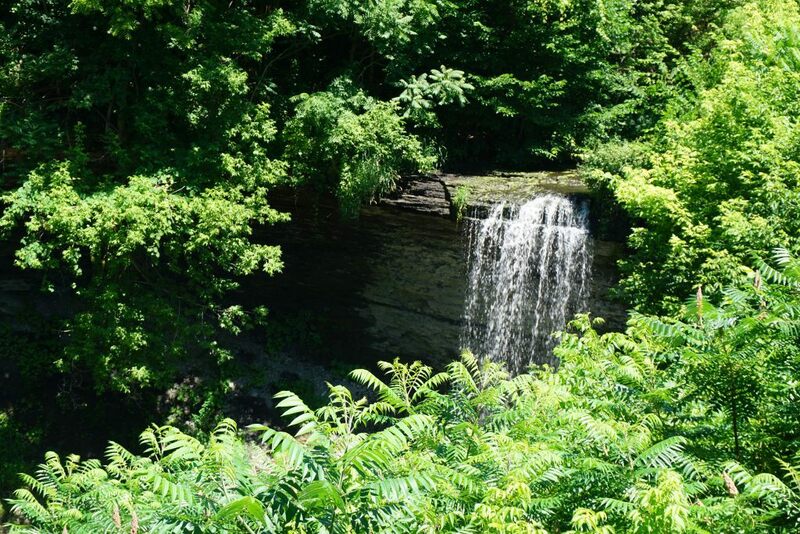 The view of Wolcott Falls from the viewing platform. Leo enjoying the cool shade. They splashed happily along as we followed the river to the base of the falls and once everyone had cooled off, we turned and slowly climbed back up the hill. 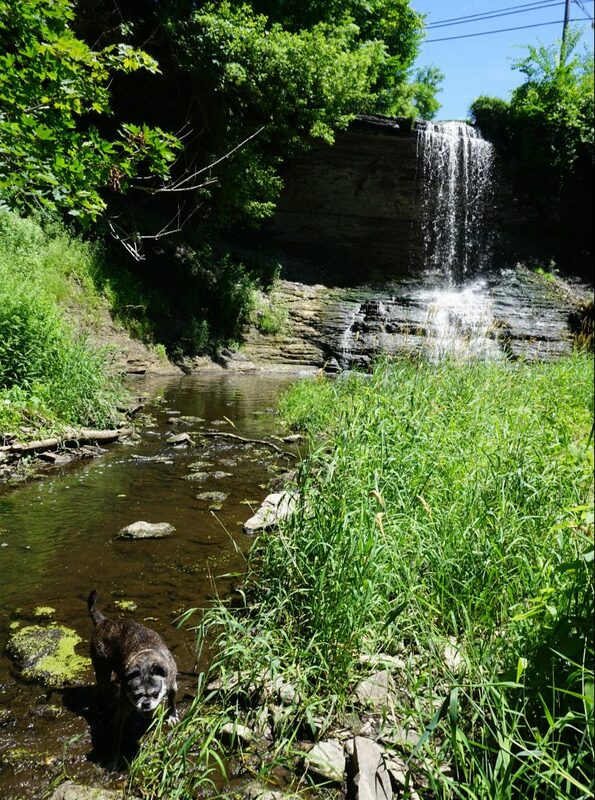 We made several stops because I was worried that Piper would strain her legs with all of the climbing in and out of the car and splashing in rivers. She was content to saunter along instead of bound up the hill like she sometimes does. 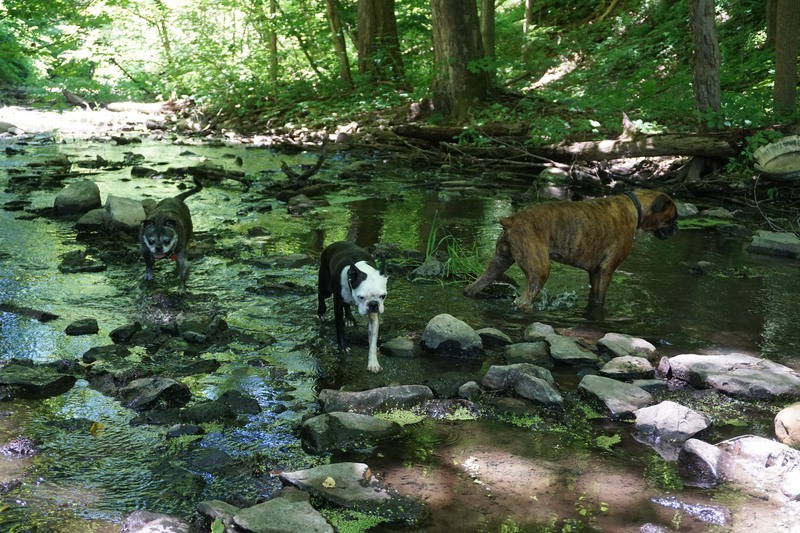 With happy and wet dogs loaded in the car, we turned back onto the road and continued east. 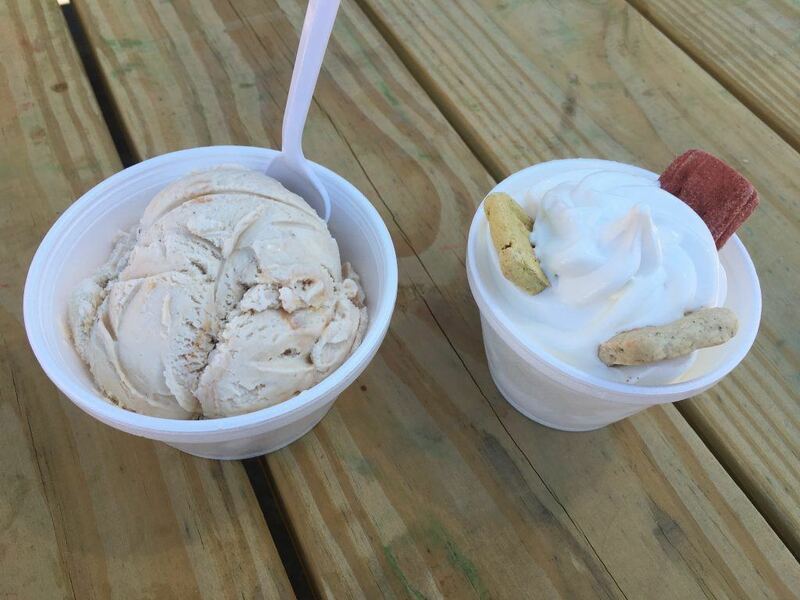 We stopped in Oswego when I saw Six Scoops Ice Cream. Not only did I get a cup of salted caramel ice cream but they also have cups of ice cream for dogs. I was going to get a cup for each of the dogs but when I saw how big the cups were, I decided that they could share. They did each get a cookie in the cup which I held while they all shared the ice cream. I think I ended up wearing most of it. A treat for me and a treat for them. We left Lake Ontario behind us and began to follow the St. Lawrence River. For some reason, the Great Lakes Circle Tour does not circle around the north shore of Lake Ontario. Part of the Circle Tour is composed of the Great Lakes Seaway Trail along the south shore from the Ohio/Pennsylvania border, ending at Rooseveltown, New York and we were now on the last part of it before it ended. Fun fact: The St. Lawrence River is one of the longest in North America. As we drove, I started to see signs for Clayton Distillery. My boss’s name is Clayton so I figured that I could get him a gift that literally has his name on it. There was a huge variety to choose from but since I couldn’t bring the dogs inside, and I didn’t really want to be taste-testing everything, I asked what the big sellers were and she told me that the Admiral’s Berry Flavoured Vodka and Lemonade Shine were the two top-sellers. As I was purchasing my bottles (yes I bought some for me too), I also bought a slushie made with the berry vodka. 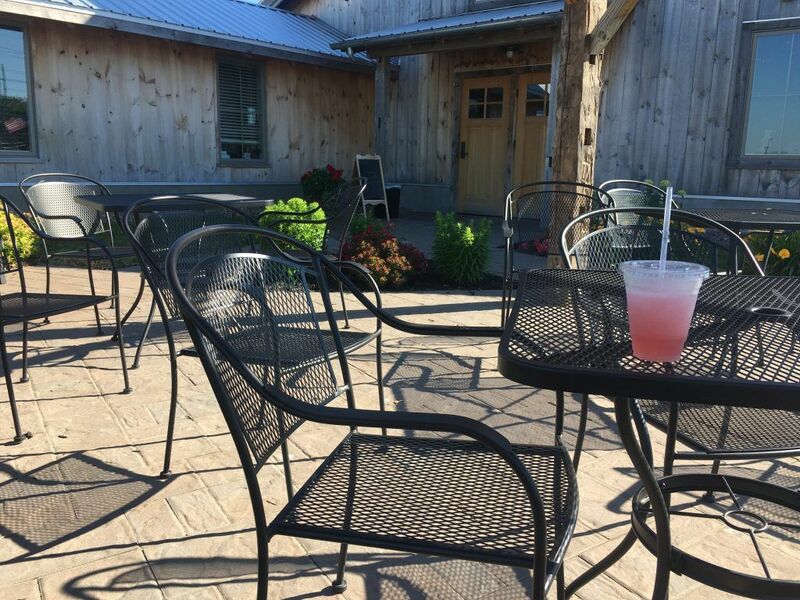 The dogs and I sat on the patio and I drank the slushie while the dogs acted as greeters for all the customers visiting the distillery. Not a bad place to enjoy a grown-up slushie. Not a bad site. Too bad it was ruined by the neighbours. 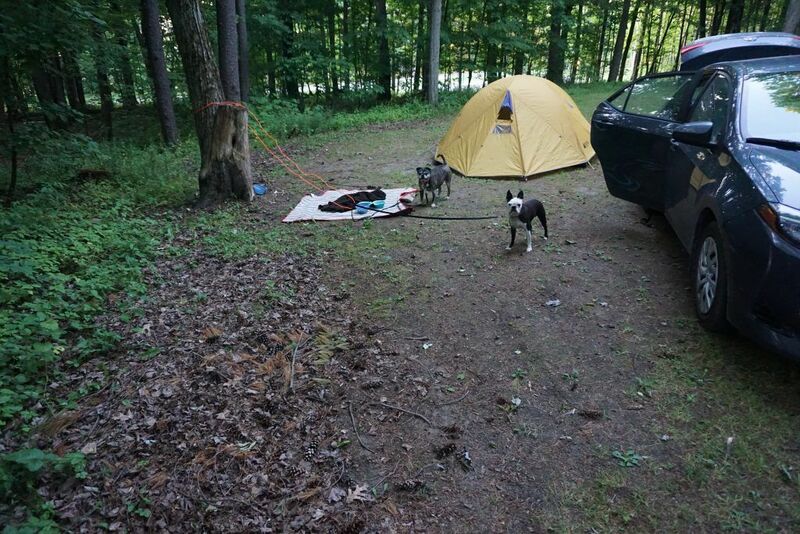 That left me in a bit of a bind with no reasonably priced, dog-friendly hotels nearby and a state-wide policy of a two dog limit in the state campgrounds. In the end, I did find a place to stay but let’s just say I kept my fingers crossed that no staff members came by. No you didn’t miss the place; I just won’t mention where it was. As I was setting up the tent, I noticed that Piper didn’t want to come out of the car. She seemed a little off, had been drooling slightly, and was content to sit by herself until I brought her out of the car. I just assumed that she was feeling sore and decided that we would take it easy tomorrow which was not a problem since we would be home anyway. We curled up in the tent and fell asleep listening to people who thought that shooting off fireworks in a camping area was a good idea. Want to read about our first day on this leg of our Great Lakes adventure? Start the entire trip here. Or click here if you want to go to the beginning of our drive around Lake Erie and Lake Ontario. 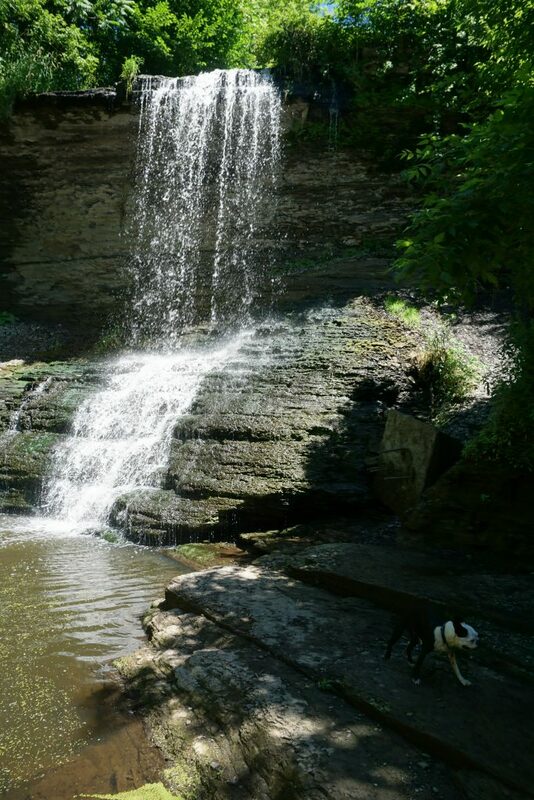 2 response to "The Great (Lakes) Escape – Waterfalls and Curveballs"
Those were nice pictures of the waterfall!